Is BJP overselling the Gujarat Model to the masses already victimized by UPA’s corruption? The Gujarat growth model, being marketed by Narendra Modi is being hailed by the middle class as a solution to all the problems of the nation. We intend to understand its strengths and weaknesses and indicate a constructive alternative model of growth. 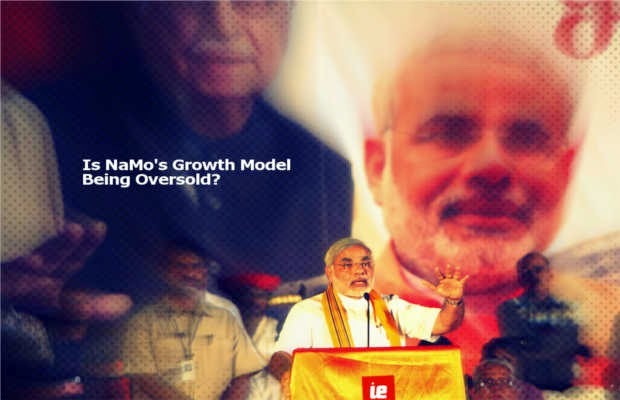 This article is Part 1 of a three part series on Narendra Modi’s Gujarat model. While it cannot be denied that Gujarat has seen growth in terms of water, electricity and good roads, there are some aspects of growth that need to be analysed. One of the argument for the Modi growth model is the legitimacy it gets due to 3 consecutive electoral victories. Congress has been ruling India for 60 years, CPM had been ruling WB for over 30 years, Lalu had won 3 terms. We do not subscribe to electoral success begetting good governance. Gujarat has seen high growth rates for the last 20 years, even before Modi came into the picture. So the high growth in recent years is a continuation of the sound growth in the past. The Chimanbhai Patel era (1990 to 1995) was one of extremely high investments. Owing to these and subsequent investments, growth rates for the period 1995-2000, were around 8.01 per cent. From 2001 to 2010, that is, under Modi’s leadership, this number has risen to 8.68 – a marginal increase of 0.67 per cent. Gujaratis have been known to be excellent tradesmen and entrepreneurs for centuries. We concede that a business friendly atmosphere has been continued by Modi, which has resulted in this marginal growth. Fortunately for Gujaratis, there has been good rainfall and almost no drought in recent years. What must be noted though is that Andhra Pradesh, Haryana, Maharashtra, Punjab, Tamil Nadu and Uttar Pradesh have also experienced growth at comparable rates. In either period, Gujarat was not at the top (as is being made out by Modi supporters). In 1995-2000, it was at second position, and in the 2000-2010 period it was third after Uttarakhand (11.81 per cent) and Haryana (8.95 per cent). Industry has grown in Orissa and Chhattisgarh at 17.5 and 13.3 per cent respectively during 2005-09, higher than Gujarat’s 12.6 per cent. 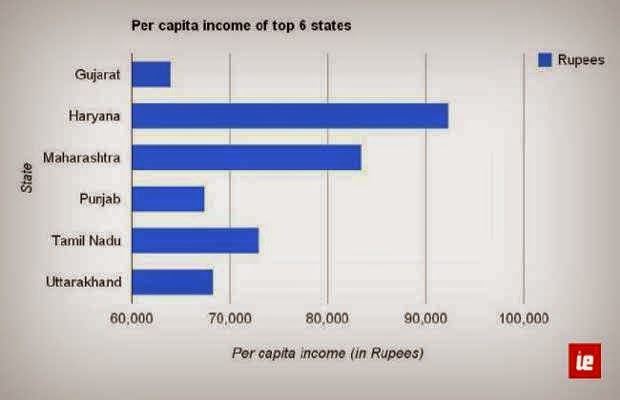 Gujarat ranked sixth among major states in per capita income in 2011, with Rs 63,996, after Haryana (Rs 92,327), Maharashtra (Rs 83,471), Punjab (Rs 67,473), Tamil Nadu (Rs 72,993) and Uttarakhand (Rs 68,292). The Sardar Sarovar Dam has been one of the key components of Modi’s growth story. During his tenure, the dam was instrumental is reaching water to distant parts of the state. However, the dam was first proposed during the Janata Party Government and work on it was continued by all subsequent governments, including Congress ones. So, was the slight acceleration in growth due to Modi’s policies as he claims or could it also have been a result of the completion of the Sardar Sarovar project, and an almost drought-free (except for Saurashtra region) ten years? The 2002 riots, which were probably a reaction to the Godhra massacre, have nonetheless put a big blot on Modi’s record. At every opportunity it gets, the Congress uses the riots as its ammunition to label the BJP and Modi as ‘communal.’ The BJP then counters it by telling anyone who would listen that since 2002 there have been no riots in the state. We want to go beyond the communal angle and consider the riots from a purely security-centred perspective. For a moment if we ignore the religion of the Indians who died, a question arises: How can Modi be an ideal leader when he failed so miserably at protecting the lives of over a thousand of his subjects from rogue elements of the society? It is the State’s principal responsibility to ensure peace and protect its citizens – Mr. Modi failed in this Rajdharma (a primary duty of the government to protect all citizens, regardless of their castes or religion). He is alleged to have encouraged, if not engineered the riots, but so far has been cleared by courts and tribunals. Coincidentally, Headlines Today, a television news channel ran a story on the riots this week. The report shows that the Modi administration neglected warnings and refused to impose a curfew in the city – “Despite the flurry of ground reports and advance warnings, no curfew was imposed in Ahmedabad till noon the next day. The BJP government supported the VHP called bandhs that, as events turned out, proved to be the pretext under which violent mobs were mobilized.” By the time curfew was imposed, the damage had been done. The bloodshed has created lots of misgivings about the intention of the government in a significant number of the populace. 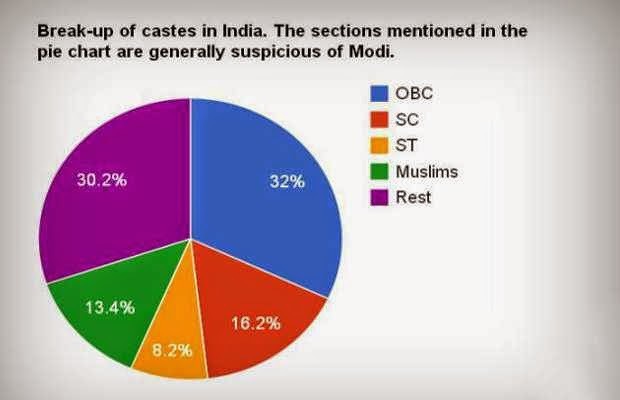 Today, a large chunk of the national electorate, namely OBC (32%), SC (16.2%), ST (8.2%), Muslims (13.4%), Christians (2.3%) – Total (72.1%) of the people tend to look at him with suspicion and distrust. They may not be willing participants in Modi’s development model as they feel insecure because of his reputation. The development model heavily favors the urban middle class. In the last 12 years, there has been a shift from focus on rural development towards an urban and industry bias. Land acquisition is rampant in Gujarat (as is the case in other parts of the country as well). One of the authors (Mayank Gandhi) once led a rally in Surat of over 25000 farmers near the industrialized Surat-Hazira belt. Their land had been taken away by the Government to make way for large industries owned by Reliance, Adani, ONGC, Essar etc. The farmers were given a reasonable price for their lands, but the loss of livelihood was much too severe for them. Their cattle suffered because area of grasslands in that region was reduced to less than one-fifth of the original area! So while industry benefited greatly, locals were displaced and unemployed. The smoke spewing, gas guzzling plants have destroyed the entire ecology permanently. Is this the model of development that the nation needs? Modi has spoken at length about how he convinced the Tatas to open their plant at Sanand in Gujarat, when their West Bengal venture did not work out. He makes a case that the people of Gujarat will benefit by automobile companies setting shop in the state. It is interesting to note that the BJP lost the Sanand seat to the Congress in the 2012 election! Had this industry really benefited locals as Modi claims, would they not have voted in his favour? By providing low interest rates, cheap rentals and waiving stamp duty, the Government did persuade Tata to set up its plant, but was this in the interest of the people? No, it wasn’t. To further add to the problems faced by the locals, the state government policy of ensuring 85 per cent recruitment for locals was also waived for the project. The fact is the citizens of Gujarat were directly or indirectly paying around Rs 60,000 for each Nano sold by the Tatas – this is a criminal misuse of authority by the Government. If one analysed the latest Gujarat election result, one could notice that in the rural areas, BJP and Cong won almost equal seats, while in tribal areas, out of 21 seats, 18 were won by Cong and 3 by BJP. While poverty has reduced in the state in general, it has done poorly in this respect when compared to other states. According to the Planning Commission, Gujarat’s rank in poverty alleviation is 11th among a list of 20 major states. In fact, the tribal population (17% of the total) in the state has actually seen an increase in poverty in the last decade. What is worrying is that Gujarat’s under-five mortality rate has stagnated and is far behind that of its peers. Child mortality is significantly higher among girls than boys and that difference hasn’t narrowed over the years. Malnutrition is very severe among Gujarat’s children and women, and the only defense that Modi could come up with was an unfortunate diversion of the issue to the dieting habits of Gujarati women. It is no surprise then that in a recent study by UNDP, Gujarat ranked 8th among major Indian states in human development and the Planning Commission’s Human Development Index has placed Gujarat as low on the list as 18! One conclusion that can be drawn from these facts is that the high growth has apparently benefited only a select segment of the population. This means that Modi’s Gujarat model is far less effective than it is being made out to be and shows that growth’s implicit ‘trickle down’ effect is absent in the Modi regime. On this note, we end Part 1. Part 2 of the series will include issues of corruption, centralization of decision making and governance problems in the Modi administration. The next installment will be out in about a week. Indian Exponent: Is BJP overselling the Gujarat Model to the masses already victimized by UPA’s corruption?